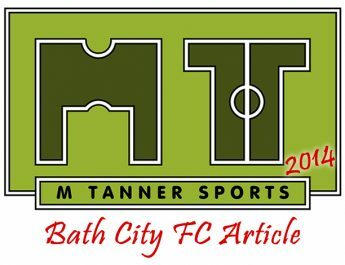 Bath City drew with a strong Cheltenham Town side 1-1 on Saturday 26th then the Supporters game finished 5-3 to the stripes on Sunday 27th. Ross Stearn opened the scoring on 38 minutes but League Two Cheltenham equalized through Matt Richards’ penalty on 76 minutes. The Supporters game between City fans had plenty of goals with Jack Rowlands, Greg McGregor, OG, Bradley B and Steve Bradley getting the goals for the stripes whilst Jay Collett grabbed himself a hat-trick for the yellows. In the blazing heat Bath welcomed a strong Cheltenham side to Twerton Park and the game got off to a slow start for the first 20 minutes. Ross Stearn had a first time shot go wide on the 10 minute mark whilst Byron Harrison saw his long shot go wide a minute later. Frankie Artus set pieces will be a big asset for Bath this season but his free kick wasn’t converted on 20 minutes and both teams were grateful for a water break on the 24th minute. Bath came out eager to build pressure on their League opponents and after a minute of the restart they did just that with a great chance. Andy Watkins was released down the right and got to the byline skipping past a couple of challenges inside the box to pass it across goal. However Stearn’s shot was saved with the rebound falling to the arriving David Pratt, but the Cheltenham defence threw their bodies at the shot and it was cleared. Cheltenham always pressed hard and looked dangerous on the break with their quick passing. Ben Adelsbury got caught out in midfield for Bath with Jason Taylor feeding Terry Gornell but his shot was wide. New City signing Martin Slocombe dispossessed Lee Vaughan on the left and hit a powerful shot but it crashed into the side netting. Stearn then had another good chance to score on 34 minutes. 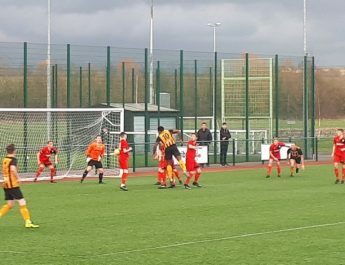 A well worked free kick routine saw Danny Ball released on the left getting to the byline to pull it back to Stearn in the box; but his first time shot went over the bar. Paul Black then got forward on a moment later for Cheltenham putting in a great ball from the right but no one on the end of it. Finally Stearn’s luck changed in front of goal on 38 minutes when Artus played him in on the counter attack and the midfielder steadied himself and finished into the bottom left hand corner giving the keeper no chance. Cheltenham made 3 changes at half time and young winger Omari Sterling-James took to the field and went on to become our MOTM. Jason Mellor in goal for Bath was having an easy afternoon up until the 49th minute when he made is first save on the match from Cheltenham’s trailist Arthur. Sterling-James held off several challenges to play in Gornell but his shot again goes straight at Mellor for a comfortable save on 51 minutes. A moment later the game starts to heat up with former Cheltenham player Andy Gallinagh fouling Sterling-James just outside the box but Matt Richards puts it over the bar. Mellor then had to make a decent save from Gornell after Artur got to the byline to put it into the box; but Mellor was alert and dived to get something on it and it was cleared. The game lost some of it’s flow for the next ten minutes with another water break. However Cheltenham got the break they needed to save their blushes on 76 minutes. Gallinagh was judged to have fouled Joe Hanks and Richards made no mistakes with the spot kick when he saw Mellor dive; putting it straight down the middle. A free kick a moment later almost put Bath ahead again with Artus putting in a great ball but Pratt just glanced it over. The last chance of the game fell to the most unlikely player on the pitch on 85 minutes. Player-Assistant Manager Steve Elliott, up from a set play, beat the offside trap but couldn’t strike the bouncing ball cleanly enough and the shot sailed over the bar; much to the relief of Mellor. 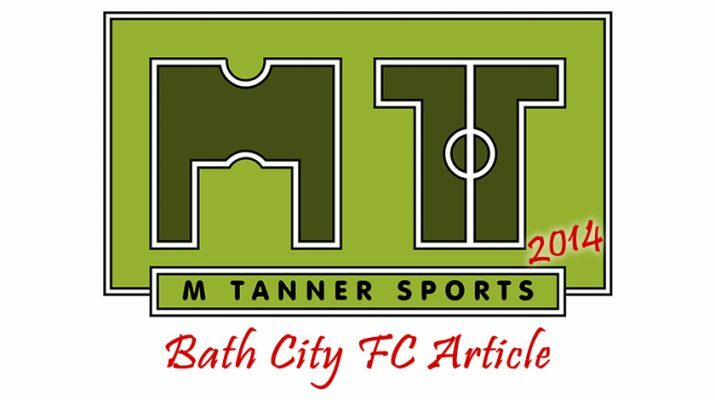 That was Bath’s last home pre season friendly and they travel to Yate Town next weekend for their final friendly before their trip to Concord Rangers on the 9th August. Cheltenham still have 3 friendlies left and will take on Bristol City on Tuesday 29th, with their first league game on the 9th August away to Bury. Best of luck to Cheltenham in their League 2 campaign this season! 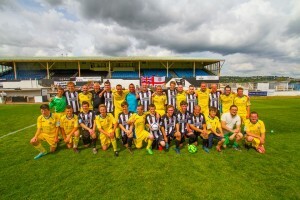 The real football this weekend started on Sunday as the Bath City faithful battled it out on Twerton Park in full Bath City kit. 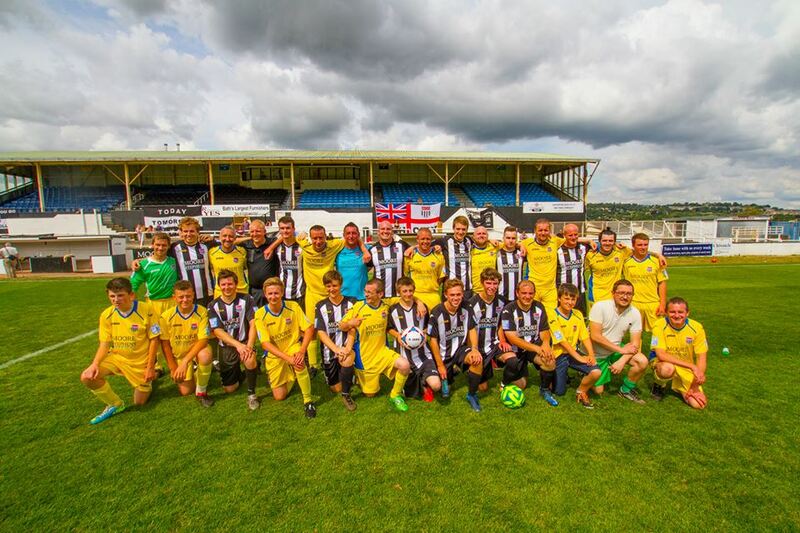 31 players were present; all paying £15 for the game in a bid to raise money for the club. There was food laid on afterwards and the bar was open all day for spectators and the players after the game; a great day was had by all! The ‘Home’ team started the brighter with good attacking pressure from the off, with several corners. 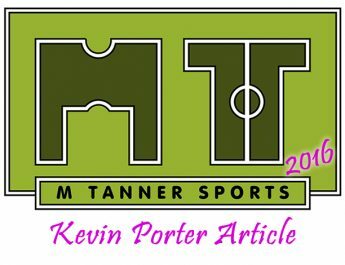 The closest they came to a break through was when Mark Tanner hit a half volley, after it was half cleared from a corner, but it crashed on to the underside of the bar and out. The ever lively Jack Rowlands lead the line for the home team and opened the scoring after some brave defending; putting it out of reach of Kyle Brooks in goal. Then quickly after Greg McGregor made it 2-0 with a decent long shot on the edge of the box. Pat Glover had little to do in goal for the home team up until the first water break with Paul Butcher and Will Standen keeping the strikers quiet. However this all changed after the restart with Chris Reed coming on for the away team. Dave Phillips and Reed worked a short free kick releasing Jay Collett over the top of the home defence to finished well past Glover; 2-1. Then an almost identical goal a moment later to equalise from Collett running on to a long through ball. The home side reacted quickly to this new threat by placing a defender on Collett for the rest of the game. The home side then regained the lead from a Rowlands cross on the left and young Bradley B jumped highest to make it 3-2 going into the break. Lots of changes were made to both teams as the heat started to sap the game of energy, with only the younger fans still running. Andy Skinner and Rob Appleton became key for the home side, doubling up at centre back when needed. Prolific Sunday League goal scorer Paul Hill put one away but at the wrong end to make it 4-2 to the home side after he was under pressure at the back. Standen then came off the pitch who was marking Collett and the striker snuck in past his new marker to make it 4-3 with just 5 minutes left. Every player on the away side then had that extra yard of pace, but it was the home side that struck at the death. It was so late that the man in the press box thought the game finished 4-3 but Steve Bradley broke on the right to fire a powerful shot home right on the final whistle. 5-3 to the home side. A big thanks to the referee James Rampton for giving his time up to ref it at no cost to the club and to everyone that helped make the day a success. It won’t make the club debt free but goes a long way in reducing some of the running costs as everyone wants to see a successful Bath City FC and we can only do it with your help in supporting days like this.